priya stood up .. stopped riya to go near ram. She wiped her tears. And looked at Ayesha. N then at ram, he is confused and was not sure of why the hell riya is appearing as two.. " rajath am going, dayijan bachhe bhi agayi .. unne sula deti hu .. ap ki surprise acchi lagi .. my baby is with me thank you . And am sorry for everything, ram ki taraf se bhi am sorry hum kal baath karthe hai.." she hugged dayi jaan , tears fel on dayijaan shoulder. " please take care of ram .. he is drunk am sure Ayesha won't look after him please.. take care of my ram" she was rushing towards the door and went off when ram seeing her body disappear from his sight. he fell in the couch.. "chali gaye . mera biwi phir se mujhe chodke chali gayi.. pata hai daaijan even if u wont tel anything ill know ,she asked u to take care of me na.. I know rajath , dayijaan , cady rina.. batavo aap sab what do u want am The ram kapoor. Thank u kehana hai. U all gave lots of love n happiness to my priya, n been her strength.. I will do anything for this reason. I will give everything unto ur name call ur lawyer rajath"" ram relax.. ab tum so jao" Ayesha heart was broken it pained twice more than rams slap. Y was she there when ram has no property. Rajath took ram to his room when Ayesha was about to come " hey u stay away from me.. rajath my brother ask her to go" Ayesha left the place. Ram lying on the bed murmuring .. " mera twins.. priya ka koi galti nahi hai. Bardash nahi karpayi yeah sab ''.."
The very next morning priya opened the door she found karthik. She was surprised to see karthik all of a sudden. He straight went to his room saying he is tired and need to sleep. Priya continued her daily work at home, made spl breakfast to karthik. She was about to leave the house shipra called her " I need to talk to u" " with me maa' yelo bank card lo do what ever u want" " I don't need ur bank card.. I want to know if u love ram or not" " oh I thought u called me normally I dint know ur on a mission.. how wil it make a difference if I love ram or not , I will never tell him . 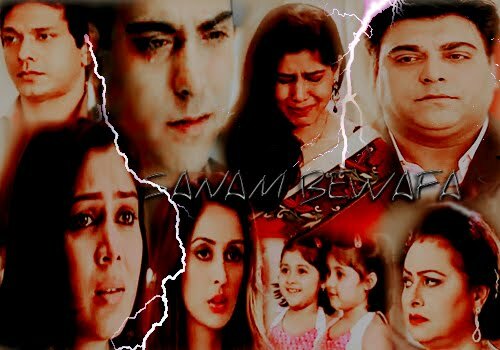 don't worry maa" " ok" " was the proposal came for Ayesha" " ur getting late go now" priya understood it was her mother trying to change her fate . she understood every thing. " maa ans me maa was the proposal came for me?" Ayesha enquired , her eyes were red and swollen because of crying. Shipra pulled Ayesha to balcony " nahi they asked for priya but I tried to link u up with ram. U like ram right" stupied people dint know karthik was in home. Shudir overheard the conversation " shipra'." He shouted.. " what the hell ur doing to priya.. n what is that ur teaching Ayesha have u lost it" " am just securing ayesha's life. Nothing else." Sudhir went away from the place. " this was my in ability to change u". ram came to her college called her out. " look priya u r a professor here I don't want to spoil ur image better is that u come along with me."" y should I do have my vehicle" " I will smash ur tiny toy vehicle if u reject "" ram y don't u leave me.." " come sit wil talk on this topic or otherwise ill force u to do so" she sat in the car silently . " wont u ask where r we going"" if u want to say .." ram decided to taunt her .. " kal humaari shadi hogayi na, one ritual is left" " what.. when are v married n what the .." " haan hogayi na .. I kissed u and made u mine .. n now don't tempt me in the car. I still feel those tender lips on mine" " raam ''!" " ok ok we r going to hotel to finish the ritual" she kept silence.. " I will take this silenc as acceptance .. for our suhhag raath"" what rubbish ram .. stop the car am going'" "if we do it now ur mom will never say anything to our marriage.. no one know about our private marriage na" " rammm' ur disgusting" soon vik came to them .. " ram everything is set"" am proud of u my friend" neha came to priya .. " am so happy for u both .. ram said us everything that u people.." a sound came "priya'''. !" she turned back found nuts and karthik . all around the person who was nervous is priya ..
her mind is restless around many more questions .. was ram serious ? I do love ram if I lost on him ? no I cannot do this ? if ram insist I can't even say no .. disturbing her thoughts ," di am so happy for u and for , nuts and neha" " what .!" priya pulled ram .. aide " what is this ram u told everyone that we r married.. y r they sounding so odd. What's happening.. this is not going to happen, what kind of a brother r u ? do u plan this all for ur sister too .. ram aaap se ye umeed nahi thi.. am going .. leave me ?" " hello I even called karthik for ur support and neha is always on ur side, u have lot more to pat ur back don't get panic.. what will they think of us standing this close and talking to each other??"" what .. hold it on .. what is this ram am not able to get what ur up to ' what did u say about us" " what really happened between us to say .. I forced u in kiss n was not u.. na .. what is there nothing is from ur side that means am after u not u .." " how can u say this I don't have any feeling , do u think am a stone hearted idiot who could not feel the first kiss ever in my life.. I dint not reject u .. pata hai iska matlab kya .. leave it u can never know my heart" .. " I knw u better .. its better we move from here n go inside. We r getting late will discuss every thing in detail later "
they all went inside.. priya was tensed when she entered she saw a beautiful table decorated in a corner. " it's just a dinner.. am not going to touch without ur will.. Relax. Yes its true I want u in every aspect but not against ur will" he whispered in her ears.. they reached the table. "So here it is for vik neha. Congrats guys" ram announced the reason of the dinner.. it's the celebration that neha conceived ' they opened the champagne bottle served to all every one drank but not neha n priya. Ram asked to take a sip she bluntly said no. she saw ram ordered more drinks. She went to the bar counter along with him .. " ram stop drinking ram"" celebrating my friends happiness" " stop it ram I don't like u drinking like this" " priya .. I will not drink too much u have to do something for me"" what if u promise me u do this every time u want to stop me drinking" " ok now keep the glass there.. and tell me" " kiss me.. priya" " what ram u have fully lost it.." he pulled her close to him " kiss me am serious' if u don't want me to drink then kiss me every time to control me. tell this with ur lips On mine"" leave me . all r watching us.." " o I will leave but remember u have to kiss me" " so then ur going to quit drinking""yes" ''''..
ram suddenly got up from sleep .. went to rajath . " please can u do me a favour.. please take me to priya's house." " its late ram both the kids might be sleeping she is so disturbed"" I can cool her down .. she still loves me.. I need to say sorry that I drank so much today please rajath take me to her.." " ram let me call priya .."" no rajath just take me please. I will handle her"